Surveying the hot job ahead of us. . .
On Friday morning, Joe cut the first section of the hayfield and then left it to dry for the rest of the day in the sun. On Saturday morning, once the dew had dried off, he used a tedder to gently 'fluff up' the hay (which helps it dry more), raked it into windrows, and then baled it up. All of this took about seven hours. 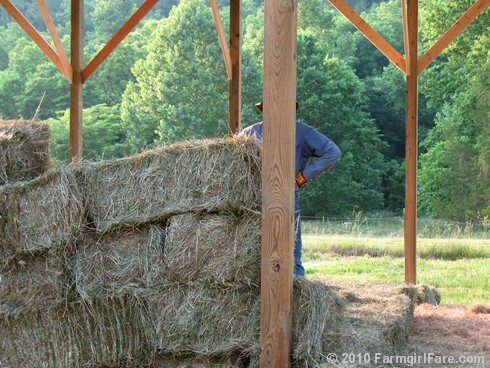 Late Saturday afternoon, with absolutely no sign of a breeze, we headed into the sunny hayfield with the trailer to pick up the first 182 bales of the season and then unload and stack them neatly in the haybarn. 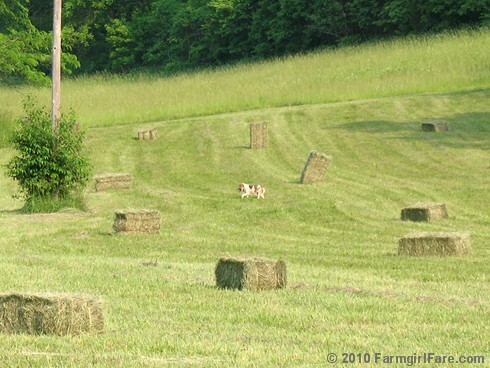 The hay looks good, but we were hoping to get more bales from this cutting. Some years this section of they hayfield has given us more, some less. When we were down to the last two dozen bales on the second trailer load, it started to rain—and rain is the enemy of hay. 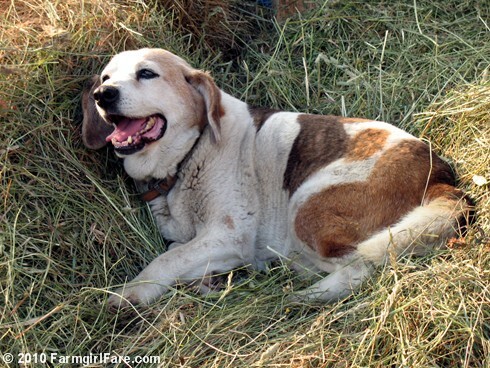 We jumped back into the truck, sped out into the hayfield (along with Daisy, Marta Beast, and Lucky Buddy Bear, who were all jumping around and barking like crazy—no doubt picking up on our panic) quickly threw the last 18 bales that were still on the ground onto the trailer, raced back to the haybarn, and covered everything as fast as we could with two big tarps. By then it had pretty much stopped raining. It was after 9pm—time to do evening chores. Yesterday morning we uncovered the trailer, let those last bales dry in the sun, and then spread them out in the haybarn so they could dry even more. We'll probably stack them on the bottom layer of hay, where they would probably get ruined anyway, but we're hopeful that they can be at least partly saved. We're just thankful that the rain—which wasn't in the forecast—didn't show up earlier. It could have been a whole lot worse—like with all 182 bales still out in the field. The baler, which hadn't been cleaned out and blown off with the air compressor yet, also got rained on, which is bad because the hay dust in all the little cracks and crevices traps moisture and causes rust. 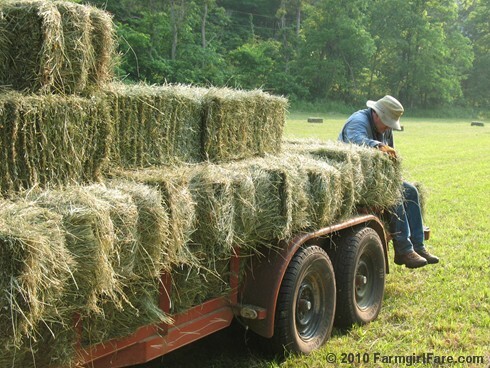 Once the hay on the trailer was covered, Joe backed the baler under the shed where we store it, and then cleaned it off as best he could in the dark. We would really like to get at least 800 bales of hay put up, so this first cutting is just the beginning. A couple of little thunderstorms blew through last night and this morning, which is exactly what the freshly cut hayfield needs. The rain should also promote more leaf growth on the part we haven't yet cut. We only got about 1/10th of an inch of rain, but in this hot weather, every little bit helps. In a couple of days, when there isn't any rain in the forecast, we'll start the whole process again. Copyright 2010 FarmgirlFare.com, the stocking up for winter before it's even summer foodie farm blog where it only looks like Joe did all the work while I just stood there sucking down ice water and happily snapping pictures. 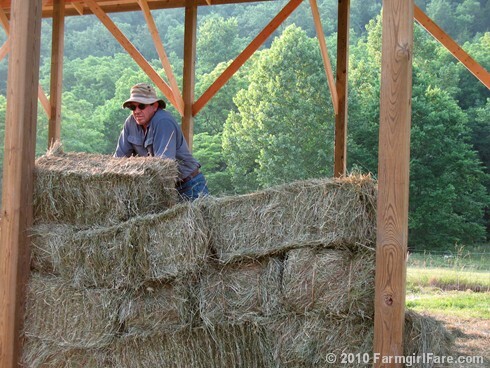 I did my fair share of hefting haybales—although being resident photo journalist is definitely a good way to sneak in extra breaks. The supervising dogs and cat, however, never lifted a paw. I have to say that haying is probably my least favourite farm job - possibly tied with picking peaches but definitely a close in the "worst farming activity" category. It's so prickly and hot! Your pictures are beautiful and make it look so serene but for anyone whose actually been stuck haying all day - especially when they were young and summer days seemed to last FOREVER, they will know that it's not so picturesque in real life! 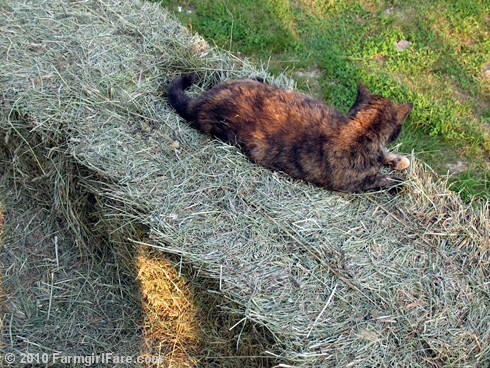 I used to enjoy hay work, but you guys do it a lot different than we do. 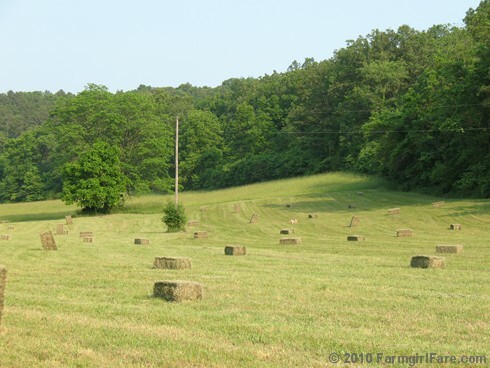 Our grass hay is in the field for at least 4 days to dry. 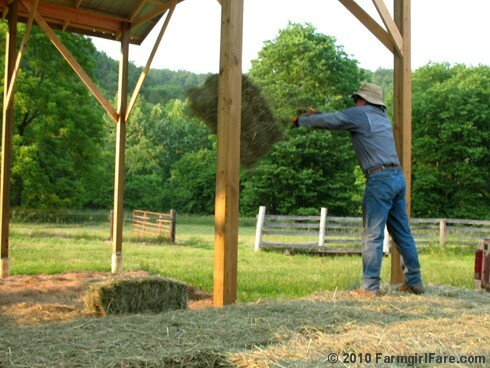 Oat hay can take even longer if the ground under it is damp. I don't recall it ever being baled the same day it's turned. Alfalfa is raised here too, and it seems like it was drying longer than a day or two also. It's evident from your pictures though that everything loves a nice fragrant new bale of hay to sit on. I am worn out just from reading this. I am in awe. It is phenomenal living like you do that you can do the work, take the pictures, write such entertaining and informative descriptions, cooks the meals (and write the recipes) and keep your lives going. 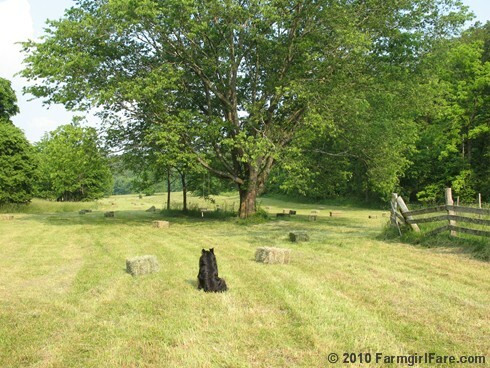 I had no idea haying started so early...The photographs are wonderful. Joe's looking a little wilted. Get that man a beer. You, too. Lots of work. I bet Joe would luv a square bale loaded for XMAS. I think they pick up 10 bales and fit on the front of the tractor. I've had to do a little 'catch-up' reading here and now I'm laughing at the roosters (he's beautiful, by the way) and totally exhausted from reading about hay baling - Wow! You guys really could use a little help. It's good to remind those of us in the city how much work farming really is. Once again, I am impressed and amazed at all you do and how much you share with the rest of us - a million Thank You's!! 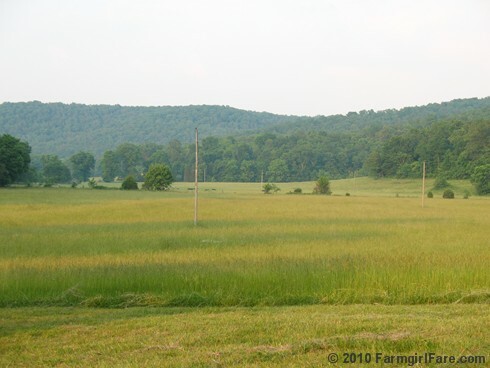 By the way, have you ever thought of agritourism? It is so beautiful where you are, and I sure would love to spend a summer days with you, even if all I did was walk around and watch stuff. 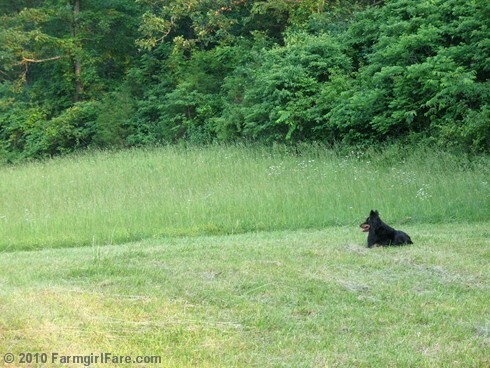 I probably wouldn't be much help, but I would love learn more about farming and have my daugheter learn too. You wouldn't necessarily have to do the B&B thing. You could have a cabin and let people take care of themselves. Will it make you mad if I say I'm a little envious? Not of the haying, but definitely of the weather. We were visiting cousins in Ireland a couple of years ago on one of the few remaining dairy farms (a big change from our prior visit pre-Celtic Tiger). We were having a grand time catching up when suddenly rainshowers threatened the remaining unbaled hay drying in the field, so everyone scrambled to finish up. 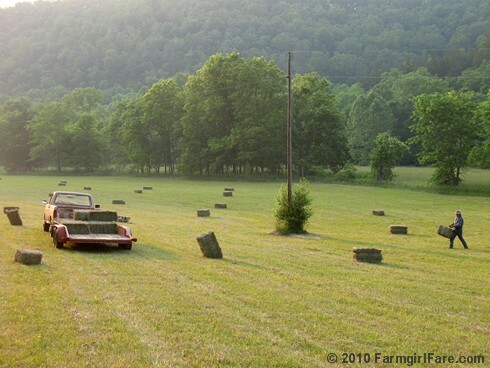 Haying is serious business!